The main attraction is of course the steam engine. It was built in 1907, and worked until 1952 in a quarry, and then for a few more years hauling scrap metal. In 1960 it was sold to a hobbyist in Vista, California (about 20 miles northwest of here). When he passed away in 1966, it was sold to another hobbyist, John Porter who lived in Poway. He restored it and built the track and train shed. When he passed away, the City of Poway bought his property in 1987 – train included – for a park. Ten years later, volunteers had restored the train and it began regular operations in July 1997. Usually they run the steam engine one or two weekends a month, and the trolley or speeder the other weekends. There are special events featuring the train for holidays — the train is “robbed” four or five times every Fourth of July, and Santa seems to like it (no snow in SoCal!). More recently they built a turntable so they can run it the other direction occasionally to even the wear on the wheels, and a new ticket office with lots of Brio and Thomas toys for sale. It’s a fun place for a young family. My kids are older now, so the train has lost some of its attraction, but we do still enjoy watching it go by, full of happy faces, as we walk to the farmers market to get breakfast every Saturday. Nice to have live steam on your doorstep! Interesting history behind that little loco too. As I started reading this my 5year old son walks over and informs me that this engine looks just like “Skylar”, one of the train characters on “Chuggington”, his current favorite TV show and wants me to read the article to him. I looked it up and Skylar happens to be a crane engine and the only similarity I see is that both are yellow but oh well, at least he doesn’t appear to be color-blind! In any case, excellent article, thanks for writing it and the pictures are great as well! If I made a 5 year old smile, my work here is done. Glad he liked it. Simulated train robberies are mandatory on vintage steam, see also the Grand Canyon Rwy. & Knott’s Berry Farm. But one of the greatest train robberies occurred in Merry England, 1963. Stone Mountain, Georgia also used to run steam, complete with a robbery. I think they only run diesel these days, sadly. The Henry Ford was running steam when we visited about 8 years ago. We were on the last run of the day, and got to experience a “blow down” (if I remember the term right) before they pulled into the station. Yeah,and they made a great movie based upon it called “Robbery”.Used to show it on US television-in NY anyway all the time. Very cool! So, in California, is this locomotive still able to burn wood or coal to operate? Or has it been converted to a cleaner fuel source? About 15-20 years ago, the Indiana Transportation Museum ran a 1918 Baldwin 2-8-8-2 Mikado locomotive in a passenger service ferrying folks to and from the State Fair. 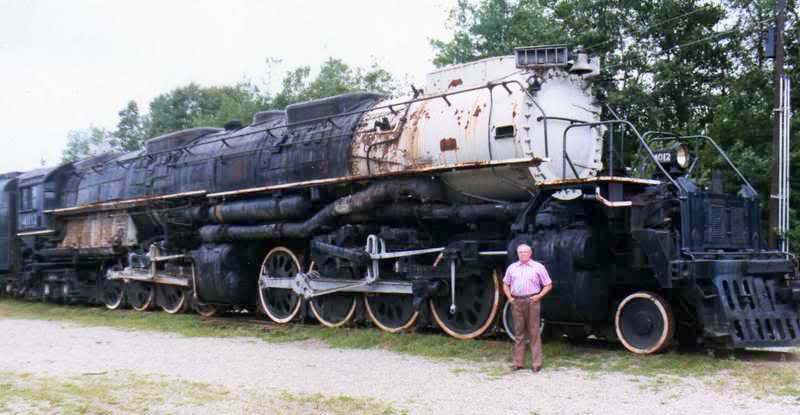 It was later pulled from service due to thinning of the boiler and tubes revealed in a Federal inspection, and has been undergoing a volunteer restoration for several years now. But when it ran, it was still billowing coal smoke and gave us the full sensory experience of an old steam locomotive. The 1940s EMD diesel electric that is used these days is not the same kind of cool. It runs oil now, and if I read the history right, it always has. They had to redo the boiler about 3 years ago for the same reason, and it almost didn’t happen – it’s quite expensive. But the public support was so strong that they got the needed $80k (IIRC) and got it back on the rails pretty quickly. I was actually rather suprised that it was running this weekend. After the Christmas rides each year, they do the annual boiler maintenance and inspection which usually lasts well into March. I saw it in the shed with with the boiler open just a few weeks ago. Thanx for sharing your wonderful story and photos. It’s so great that you can hear the whistle from your kitchen. That’s one of my favorite sounds in the whole wide world. I, too, am a great fan of steam and have visited a number of tourist railroads in the northeastern U.S. over the years. 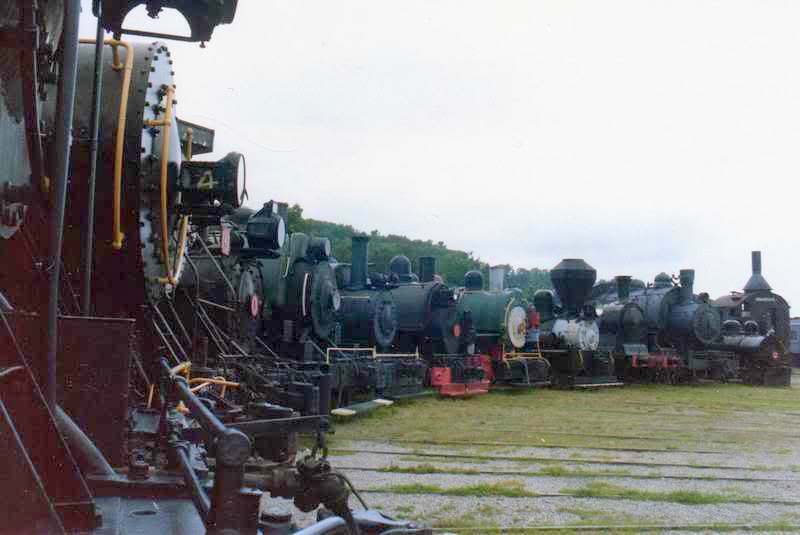 Before the collection got scattered with most of it going to Scranton, PA, Steamtown U.S.A. used to be located about 20 miles north of me. I spent many happy days there. Wow. I had never heard of Steamtown until I just Googled it. I wish my parents had taken me there on one of our annual New England vacations in the 60’s/70’s (they had grown up in Pawtucket). Yeah, it was a real railfan’s paradise. They ran steam excursions all over the state behind their wonderful old Canadian National 2-8-2’s. Sometimes the would double head them. One memorable run was made on a frigid November day. Needless to say, the billowing steam clouds were spectacular in conditions like that. Aside from what they ran, the non-runners made for a formidable display…. …and, of course, the superstar…. That’s great! 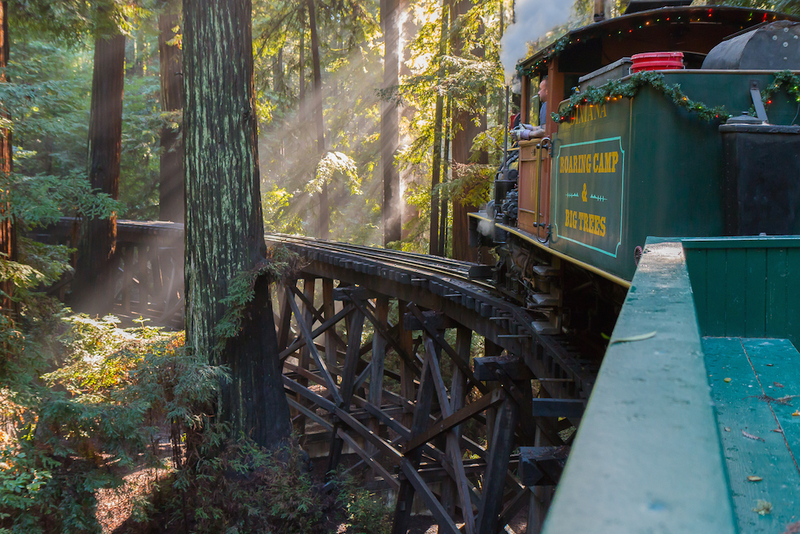 Over here in the Bay Area, we have the Roaring Camp Railroad in the Santa Cruz mountains, between Santa Cruz and San Jose. It’s very popular and still going strong today. Trains , firetrucks, and construction equipment still appeal to the kid in all of us- or at least to me anyway. That’s what brings me back to CC every day. It is wonderful that the community can keep this train running. I am aware of several projects (ships and trains) where volunteers were going to do all the maintenance and repair. All failed as the volunteers drifted away when they discovered what a huge project they had undertaken. Many were completed by corporate/civic organizations who had resources to employ the skilled trades that were needed and to buy the often expensive repair parts. Nice to see this beauty maintained and operated. Links to the past are becoming all too rare these days. VERY nice ! I remember riding a steam train some where in New England in the late 1950’s , I was entranced and ignored the Conductor’s warning to not ride in the very front of the open car , I got burned several times by hot cinders and choked on the greasy smoke but I loved it anyways . 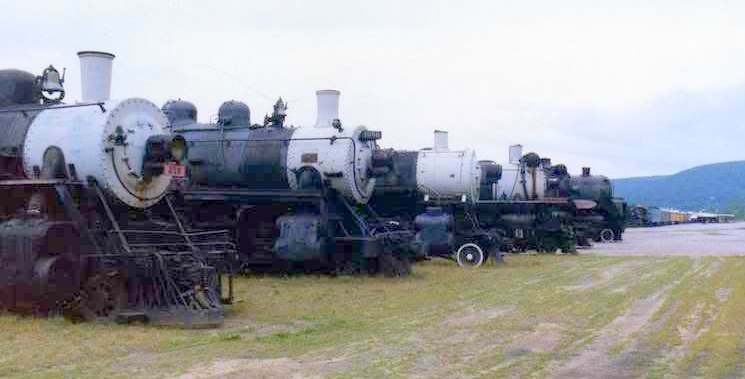 There used to be a steam train in Chama New Mexico ~ is it still in operation ? . Very cute little engine. The town would never be able to afford to keep it running if it were any larger, I’m afraid, but this is wonderful! Speaking of little railroads, when I was little, about 10 or 11 years old, the St. Ann 4 Screen Drive-In in St. Ann, MO – part of the STL area, had a 1′ gauge steam railway that ran around the place and they would give rides on weekends before the shows began in the summer. Well, it had to be me – I caught a hot cinder in my eye, and boy, did I scream bloody murder! It took awhile for mom and dad to calm me down, and a cup of ice from the concession stand certainly helped! I don’t remember what movie we went to see, but after my eye settled down, I must have enjoyed the show – AND the train, because I’m a rail nut, too! Really cool that you have that train running so close by, and that it is a real one, rather than a modern imitation steam engine. Yes Ed, Greenfield Village is still running trains around the village, and they are still coal fired so you can really inhale the “atmosphere”. When the village has one of it’s special events on, they put two trains in service to handle the crowds. They added a new locomotive to the fleet two years ago, a freshly restored 1897 Baldwin. Here’s someone else’s video of it’s first day in service. I rode it later that same day. Same loco being rolled out of the roundhouse where it was restored, for a test run. Yes, the guys pushing on the handle are really providing the power to turn the turntable. Trivia bit. If you ever saw “Young Tom Edison” you may remember the scene where he sets the baggage car on fire and is tossed off the train. 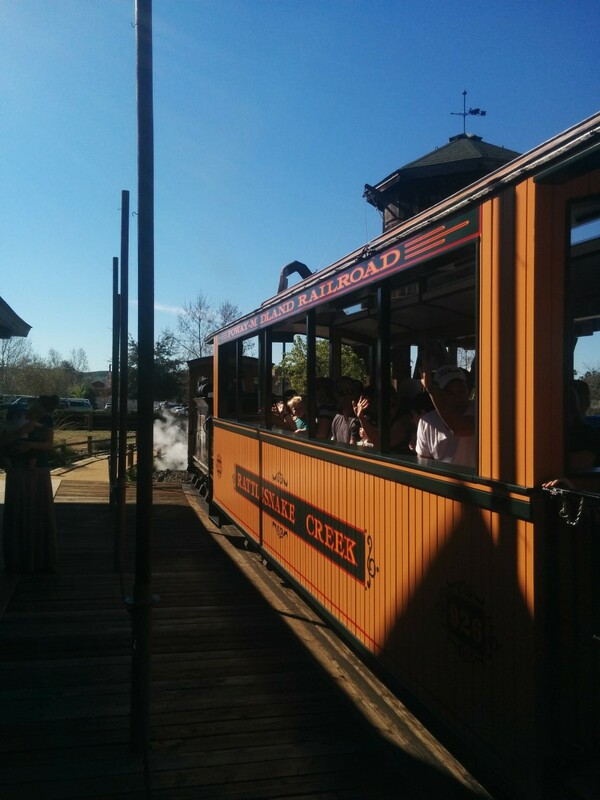 The Smith’s Creek depot that is now at the Village, is the station where Edison was tossed off all those years ago. I took this photo of a circa 1912, 3-cylinder Shay locomotive. 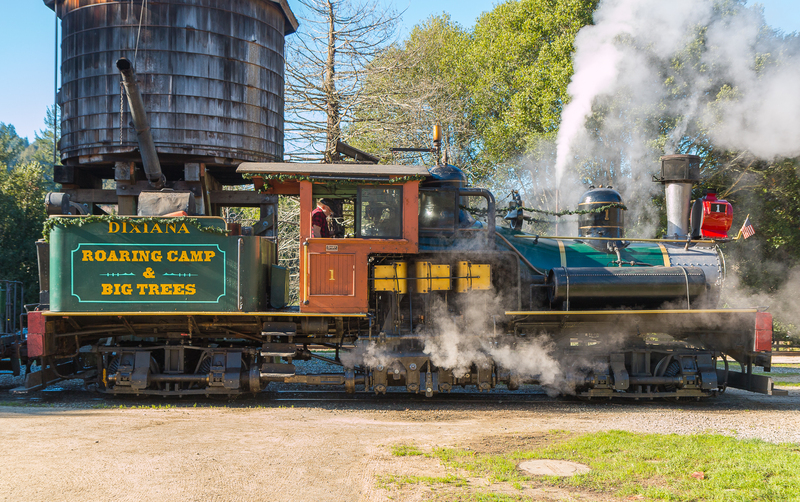 It currently runs excursions at Roaring Camp Railroad here in Santa Cruz, CA. This was originally a wood-burning unit when it operated in the Mid-west, but was converted to oil-burning when it relocated to the west coast for logging service. Another photo of the Shay rounding a bend over a trestle. The zoo in Portland Or has one like that.